Angry after visitors let two-goal lead slip. 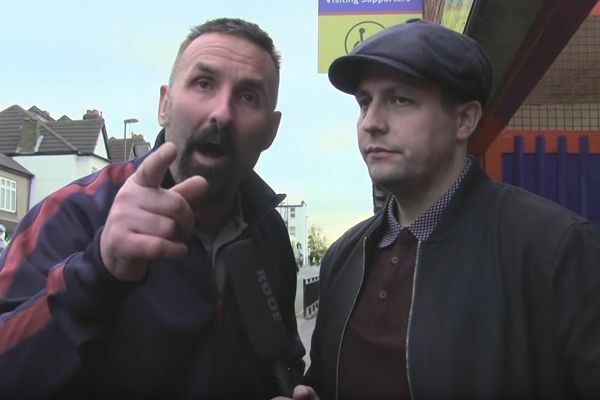 An angry, swearing supporter was interviewed by West Ham Fan TV outside Selhurst Park on Saturday after the away side let a two goal lead slip to draw 2-2. Giving us his thoughts on the game, the man appeared not only upset at the performance of the team in the second-half against Crystal Palace but also at not receiving a match-worn shirt following the final whistle. He yells into the microphone, while looking directly into the camera, despite a halfhearted attempt at restraining him by the people he was with.